Delays, layovers, attempts at sleep in awkward positions, intestinal pains from Cinnabon ingestion. Almost everyone can identify to some degree with getting stuck at the airport. Then there’s the occasional off-chance that you might get locked into an airport (say, because an angry mob is storming the planes). In cases like these, sometimes all you can do is embrace the phrase Keep Calm and Do Yoga in the Baggage Claim. Hour 0.15: Quickly walking past the approximately 500 men and 100 fully-suited up riot police, the main entrance to the Algiers airport seemed almost normal at this point. Since my five days in the country, I had seen instantaneous corner-gatherings of 200 plus people with fireworks, cars zipping around boys with flame throwers, mass looting, and burning buildings. 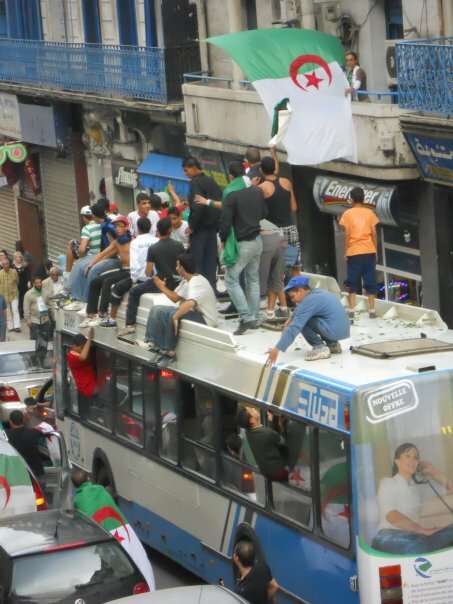 All this followed reports of multiple Algerian fan deaths in the qualifying 2010 World Cup game with Egypt only a few days prior. 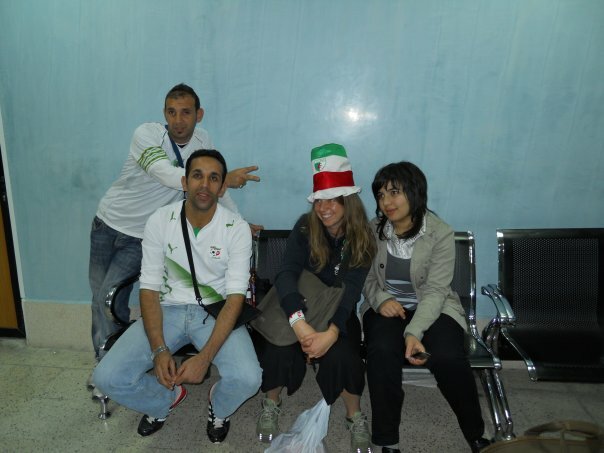 To incite the matter, the Algerian president had promised tickets and flights to the final game in Sudan to 10,000 Algerians. Hence the major lineup at the airport. Party/riot in downtown Algiers as citizens show their passports in hopes of being selected to attend the qualifying World Cup game in Sudan. Hour 1.5: After one-too-many strange Algerian sodas, the boredom broke when I heard yelling from one of the main airport entrances. A crowd of seemingly very angry people started pouring in, whom I later learned smashed airport glass walls, uprooted palm trees, and crushed concrete planters. Strange ideas come to mind when faced with an understanding that you are about to be part of something you have only read about on a computer screen from 2,000 miles away. I scanned the area, looking for exit routes/hiding spaces/anywhere a young, American blonde girl might clandestine herself. Somehow the artery of influx stopped, and airport guards quickly herded us away. 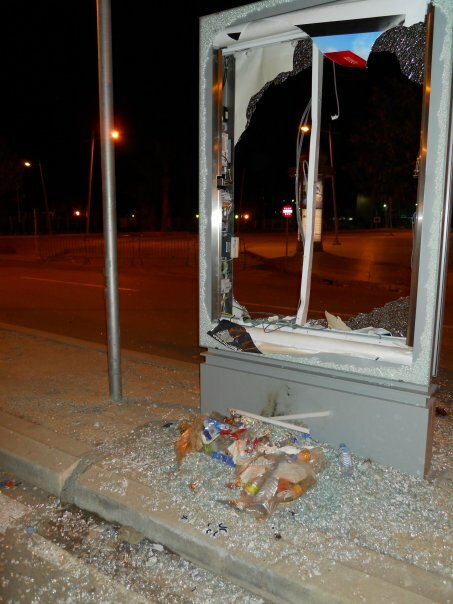 A smashed glass billboard holder lays testament to the frenzied riot outside the airport. Hours 2-7: Officially relocated to a gate of the airport, I saw people sprawled out, sleeping, or reading magazines. Occasional Arabic screaming outbursts would peak and dissipate. Insider news claimed the 500 men outside had tried to hijack a plane. The man sitting next to me told me that he had been waiting for three days to get on a flight to Sudan. When I asked him if my travel partners and I could leave, he said, “I don’t think that’s a good idea. You might get stoned.” But as the hours passed, I started meeting the people next to me and really hit it off with a group of them. I still maintain Facebook contact with one today. My new-found airport riot community. Hour 7-9: Although it would be another two hours, we were told our bags would be released at the baggage claim. One particular man frantically paced the area shouting. At this point I decided, that’s it, I’m doing yoga! So I started with Tree Pose. When I saw a man watching me, I motioned for him to join. Maybe he thought it would be a great story to tell later or maybe his back really hurt from multiple days in an airport chair, but he attempted to mimic my poses. We spent the next hour practicing yoga, only interrupted occasionally when the still-ranting man got a little too close for comfort. Of all the places I’ve done yoga, this definitely makes the list for top weirdest. Funny how sometimes in a perfect storm, we can run around in a frenzied manner, or we can do yoga with a stranger in a baggage claim and wait for whatever to pass. I can say now that in my life, I have officially done both. And it reminds me that in spaces of uncertainty, sometimes all you can do is breathe, wait for the doors to open, and meet strangers in downward dog. Do you have a story of a seemingly precarious experience providing calming insight? Please share below.